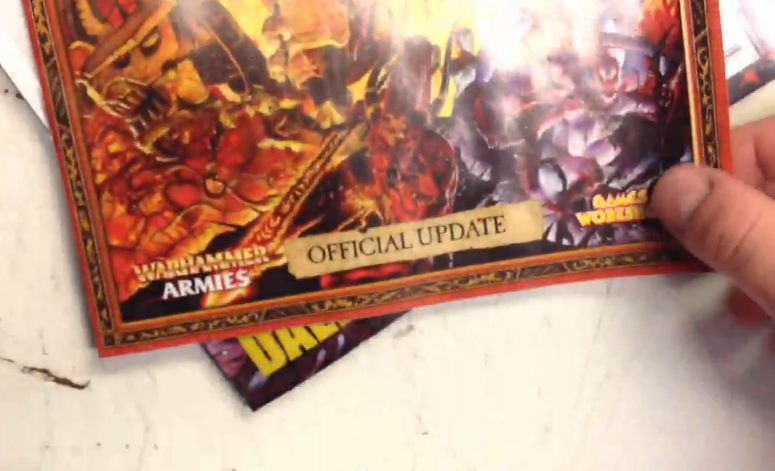 Chickhammer: Daemons, Daemons, and More Daemons! Absolutely amazing- but I wonder, how do you paint it? 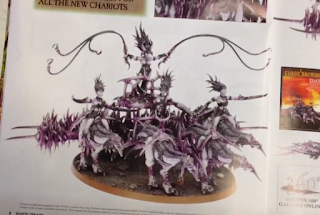 This Exalted Chariot blows my mind. Yeah, it's $60, but I'm still going to be first in line to buy it. It appears to be on the same base as the Soul Grinder, which means it really is as huge as it looks. It seems the kit is basically two of the new chariot kits combined (which are $30 each, so that $60 becomes more reasonable). 4 Hull points, counts as open topped, and is just generally awesome. How do I not buy one? The regular chariot itself is really nice, too, although less impressive in terms of scale. I'm enjoying the aesthetic they're using. I'm also a huge fan of the whips. 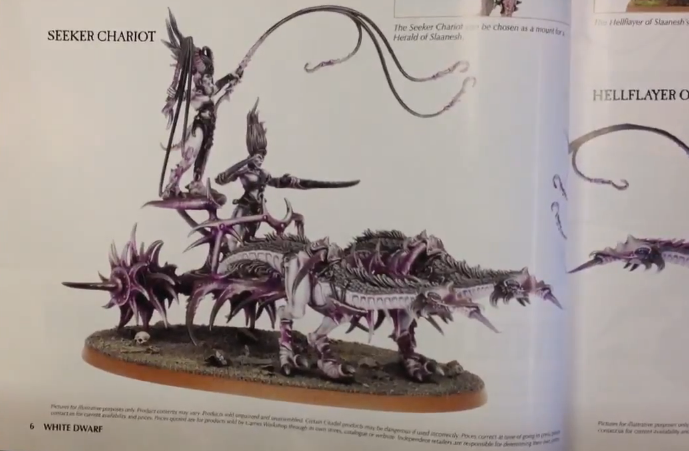 I wish those had been around when I made my mounted Slaanesh Herald. It's perfectly Slaaneshy- to the point that I'd be tempted swap it out if I suddenly turn crazy enough to mess with a fully painted model. I'm really not sure if I like these new Flamers or not. Their faces look a bit like angry, toothy ducks to me. I'll have to see them in person to be sure- but they have TWO wounds now so I'll probably end up buying another box now anyway. 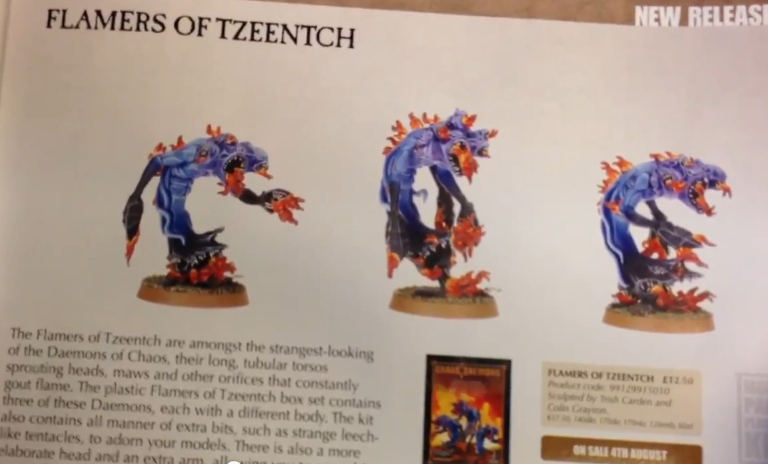 Flamers were boss before, and now they're just ridiculous. The new rules for them. 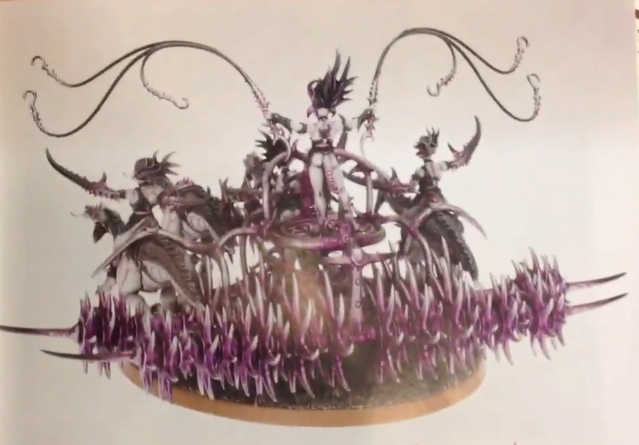 Sadly, we must still suffer the horrific Fiend models. They upgraded them to plastic- thankfully, but they're still ugly as all get out. At least no one will rage while putting them together anymore, and no more pinning either. I'll take ugly models over ones that are impossible to put together. All the Greater Daemons have been upgraded away from metal, too. There are some nice looking new plastic Plaguebearers and Nurglings that are really cool. Honestly, half the army choices got some sort of face lift- either new sculpts or a switch to plastic/resin. It's a big overhaul. This bit is really lovely. 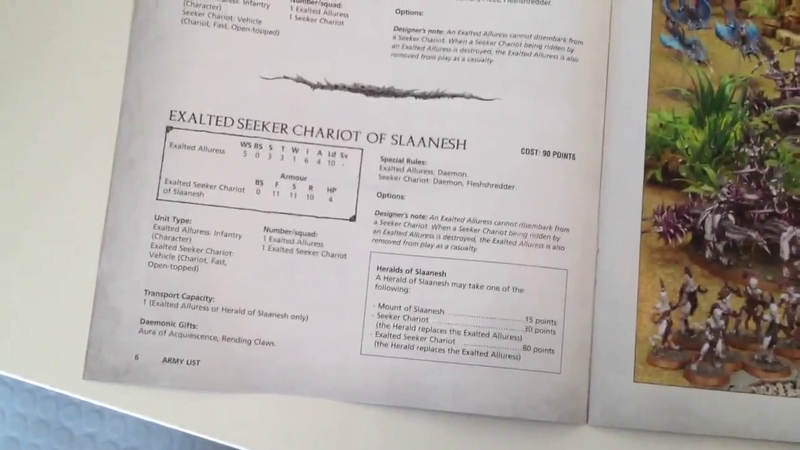 The new rules have been put together in a new pamplet that has 40k on one side and the Fantasy rules on the other, you just flip it. How handy is that? 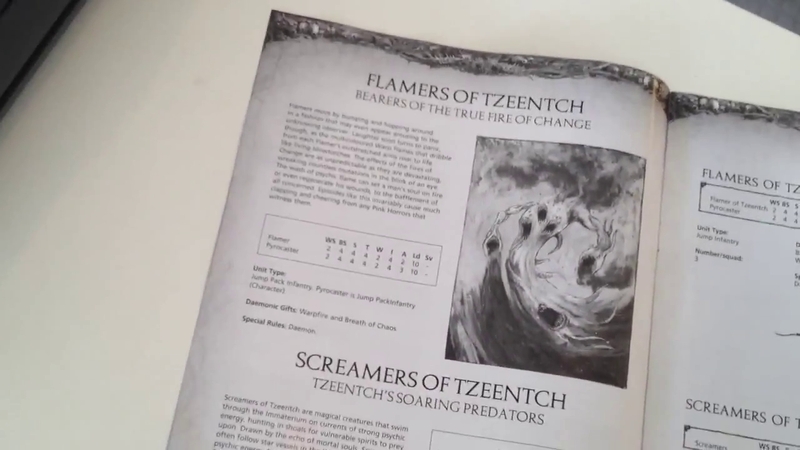 Speaking of Fantasy- the Soul Grinder rumors are true, the rules are in there for it. I personally think the aesthetic of the current model doesn't fit Fantasy, but at least it has a model (unlike many other things). Last but certainly not least is that next month's issue will be full of Chaos Space Marines! This is consistent with the rumors that have been swirling around the last few days. 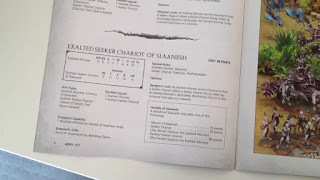 Honestly, I think that the CSMs needed the update before Daemons, but I am not going to complain when it means that I can have that Exalted Chariot in my hands that much sooner. 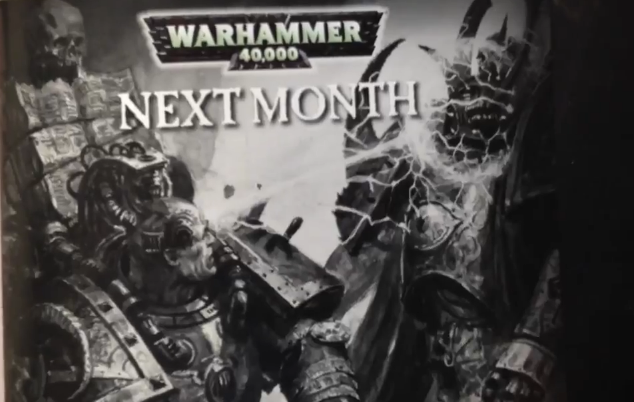 As excited as I am, this release is all bittersweet, because I've already dropped over $120 on Space Wolf stuff to start up my new army. I didn't think my Daemon as they are now would be viable in 6th, and now it looks like I'd be crazy not to keep playing them for a little while. How can I possibly choose? GW, you're breaking my heart. Upon further reflection, this may also impact my NOVA Open game choice. Dun dun dun! I'd better decide quickly, I have to get my ticket soon. For a look at the technical side, click yourself on over to The Hammer Dialectic for screen shots of the rules changes. All the images are stills I took from this video posted earlier. And here I thought I could save money for a while. Silly silly me.